A natural spring in the desert creates a wonderful swimming hole. 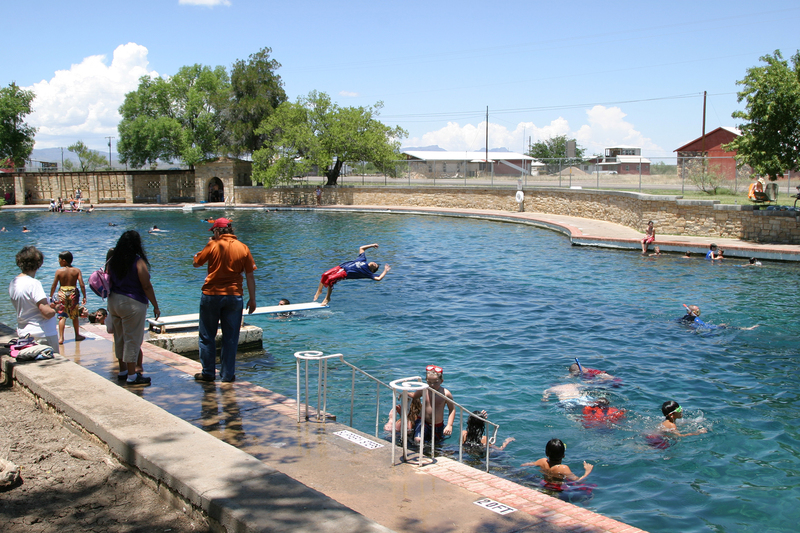 The world’s largest spring-fed swimming pool lies here in the desert of West Texas inside Balmorhea State Park. For thousands of years the springs, formed by subsurface geologic faults provided water for Native Americans and later for Spanish explorers and soldiers. Now they provide a swimming hole that is not equalled anywhere. The pool itself covers 1.75 acres, 77,000 square feet of clear cool water feeding in at more than 20 million gallons a day. Swimmers glimpse scuba divers 25 feet below as they observe several species of fish two of which are endangered and occur no other place in the world. The pool is open year round and maintains a 72-76 degree temperature even as the cold winds of winter blow through West Texas. You will find two wooden bath houses for changing and showering on the grassy shady grounds and a concessionaire seasonally. We visited on a Sunday in July. The boys were lined up to dive or cannonball off the diving board while the girls sunned on their pool floats watching. The crowds made up mostly of family groups found plenty of room to picnic and the large pool never looked crowded. The San Solomon Courts is a 1930’s CCC built southwestern adobe style motel. A recently restored desert wetland (cie’nega) with viewing platforms and an underwater viewing window winds through the park. This small park (45.9 acres) amazes the first time traveler turning off Highway 17 not expecting to enter a desert oasis. Located at the foothills of the Davis Mountains the elevation is only 3.205 feet and hot in the summer. Even so the campground is full almost every weekend so be sure to reserve in advance. The campground itself offers 6 tent sites with water only, 16 water and electric for tents or small trailers and 12 pull thru’s with water, electric and cable. The day we were there the campground was in desperate need of a litter patrol and restroom cleaning. We have visited one other time and found the same unkept conditions. Our advice would be to camp at the well maintained Davis Mountains State Park and make Balmorhea State Park a day trip (32 miles each way) to enjoy this special water world. This entry was posted in State Parks and tagged Balmorhea State Park, camping, desert oasis, endangered fish, San Solomon Springs, spring fed, swimming, texas, Toyahvale, West Texas. Bookmark the permalink. How MARVELOUS!!! What a great vacation spot.